Urban Wildlife Research Project has made education a focus of their mission. Their goal is to share the knowledge they’ve gained about the wild, to instill a greater sense of responsibility in the current and upcoming generations, so the wildlife diversity of Silicon Valley may persist with time. The Fox Guy, Bill Leikam, begins with an overview of the gray fox’s general ecology as an orientation to the life of a gray fox. He then weaves together the science through personal stories about these foxes as he follows them over the course of a year. 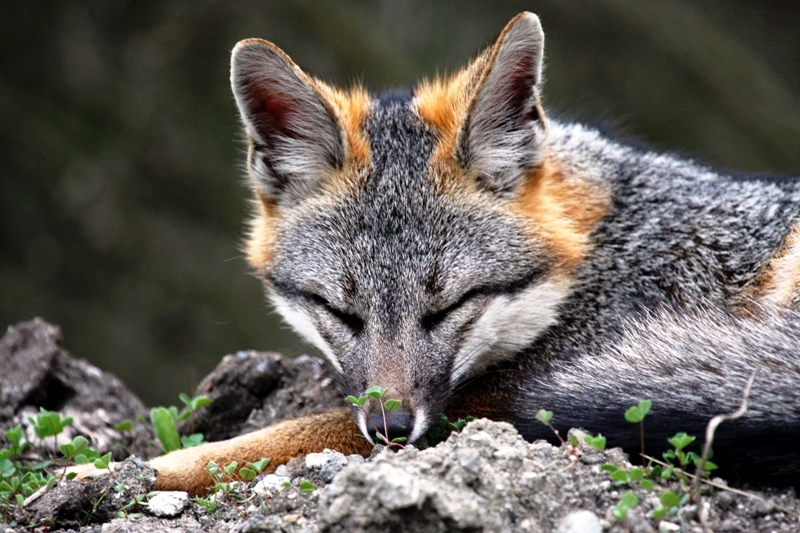 You will witness juvenile gray foxes begin new relationships, and experience the secret lives of gray fox pups as they learn how survive in their ever changing world. 98% of the video and stills are original, never before seen outside of this presentation. Our remarkable journey will conclude when the pups are indistinguishable from their parents and they are ready to disperse to new territories, find an acceptable mate and continue their cycle of life. See unique video taken by UWRP’s motion sensitive trail cameras, video camera and photographs that Bill has taken in the field. Until the Fox Guy began his study of the behavior of the gray fox, no one had ever accomplished a comprehensive study of their behavior. Very little was known about them. In March 2013 UWRP captured the first video evidence of the return of a Keystone Species to Santa Clara County, the Beaver. This presentation or guided hike will re-cap the historic discovery of Beaver on the Guadalupe River in Downtown San Jose, when they inhabited the confluence next to the Shark Tank Arena. Discover how they survive in the urban waterways and what benefits/challenges Beavers bring to the urban environment. Also covered, UWRP’s survey of the entire Guadalupe Watershed in search of more signs of Beaver and how you can help. Follow the lives of the Western Burrowing Owls living in the Concrete Jungle of Silicon Valley. Only 36 pairs of owls remain in our county and they are projected to be extirpated, locally extinct, within the next couple of decades. 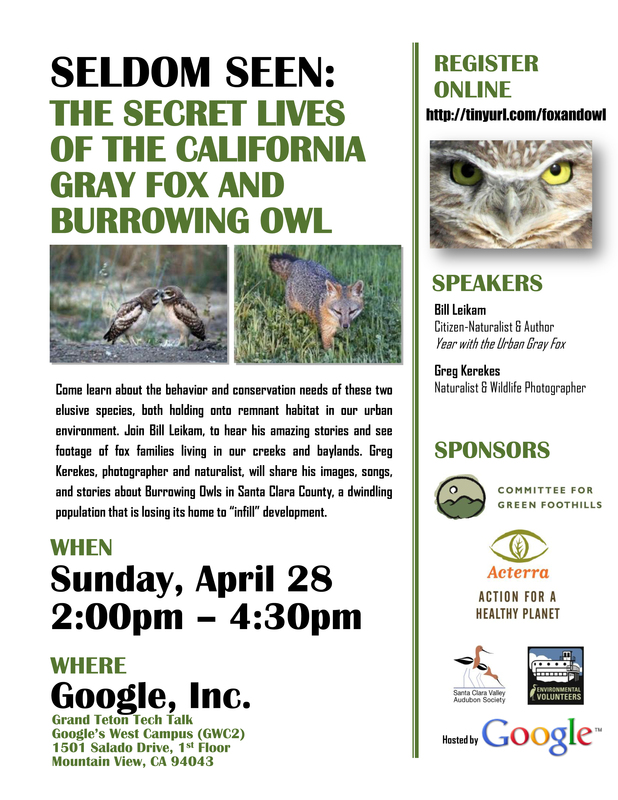 This presentation or hike will focus on the ecology of the burrowing owl and the groups in the South Bay that are working to preserve this threatened species. Discover how you can do your part to make a difference in the success of wildlife in Silicon Valley. This presentation or guided hike will focus on tools, apps, and methods the citizen scientists of UWRP use to help urban wildlife. For example, UWRP uses GPS tagged photos and video with Google Maps/Earth to identify the location of flora and fauna, or to report road kill hotspots within wildlife corridors. Also learn simple scientific methods on habitat surveying and reporting to wildlife agencies, property owners, and the public. Bill Leikam currently gives public fox walk/talks at the Don Edwards San Francisco National Wildlife Refuge from the Fremont Visitor’s Center. Title: Seven Ways to Know If You’re In Fox Territory. Free to the public. The last Saturday of every month. Outreach – If you would like to have UWRP give a presentation or host a table displaying our works with the gray foxes and other urban wildlife, fill out the form on the Contact/Bio page and we will get back to you promptly. Negotiable for private, in-home gatherings.